Mother of All Swag - Mooiness! 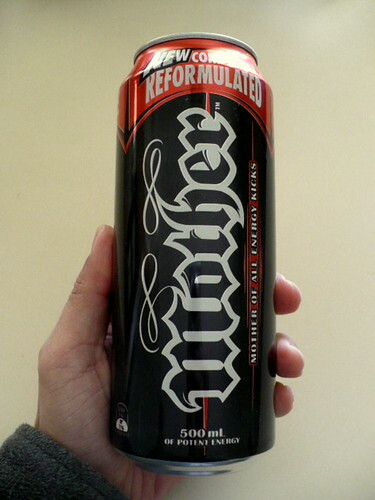 Last week I had blogged about my approval of the new Mother energy drink. The next morning, I received a nice email from the PR rep handling the product. 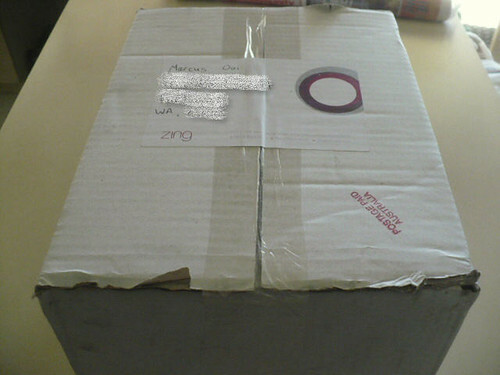 A week later, a non-descript box landed on my doorstep. It felt heavy and I could hear the clanking of metallic cans. Awesome. 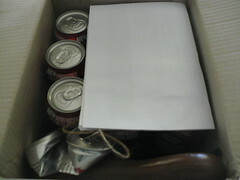 Inside it were 9 cans of Mother, a letter with a crushed can of the old Mother, and a mysterious looking piece of brown plastic. What was it? This! 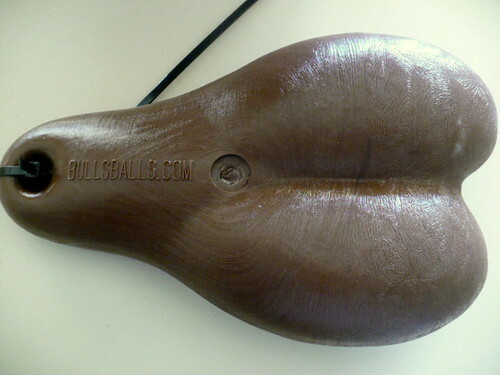 Bullsballs.com! Balls to drink Mother? I has them! Oh and this is how big a 500mL can looks in my hands. Yes I’ve got small hands, but it’s still a big 500mL can of caffeine and sugary, artificial fruit juice goodness! Yeaaaah boyyyyy! Yeah I know – I’m doing exactly what the PR company had wanted me to do. Send me some free stuff, watch me blog it, and get some cheap publicity and advertising. But hey, I got free merchandise too so it’s a win-win situation. Besides, I wouldn’t say I like drinking the stuff if I didn’t. And yeah, Converse and Adidas? I like your stuff too. And so, being the good corporate shill that I am, I interrupt this post with some words from our sponsor. Personally, they should have just sent me some of that old Mother instead of crushing them. But hey, this is the price of progress! Thanks again Stuart! This entry was posted in Photo blogging on Friday August 15, 2008 by mooiness. Yay! Blogging pays off. Well done. Nice! Btw i heard taurine??? was an ingredient found from bull’s testcs..correct me if im wrong ! I found this out when i asked my Thai friends about the redbxll logo ! No wonder there is a pair of em’ ! the balls are a classic touch!! woo hoo!! you think they will send some to me in SINGAPORE?!! nadnut: I like the taste of it better than Red Bull. You’ll get to try it soon when you come here. Cherisher: heheh receiving presents always make me happy! btx: yup I read that too. These days, it’s synthesised rather than extracted from the real thing. Hah! blinkymummy: it is isn’t it?! I was like whoa … this is so obscene and I love it! Well, if they ever sell the product in SG, you can blog and try your luck??? Lupin: really? I’m picturing in my head and it’s not a good picture. Heh. U have to watch it to uderstand. Now that is good marketing! Thats a good rep team. The old commercial was creepy (but the voice-over was strangely soothing). Did you mention that to them? I thought the old taste was alright though I only had it once. 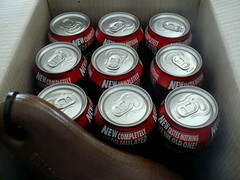 I`m not an energy drink person. Most Japanese people hated it (but they also hate Sarsi, nooooo)! BigZapfer: yeah definitely good for spreading the word cheaply because I’ve already got friends asking me about it. Katie: heh, Pop Tarts eh? Somehow Kelloggs doesn’t strike me as being hip to the blogs. Hah! Yuuka: the one with the bug-eyed creatures? Heheh I liked it. If they hate Sarsi, then they must hate A&W root beer too?! I like Root Beer. Though A&W is gone in Singapore, we have the medication bottle kind of root beer to turn too. Hahaha. Lupin: medication bottle kind? Don’t you guys get the A&W cans? It’s as close to the real thing as you’re gonna get when you don’t have the restaurants. There is one brand that comes in a brown bottle that look like those medication bottle. the same brand also carry ginger beer. Yes, there are can A$W Root beer, but I feel the former is nicer. You are making me so hungry. I`m going to pool my money and open a joint. Lupin: I`ve had those, they taste awesome! We only get the ginger beer here freely though. Lupin: I see. Shall look for it when I’m next in SG. Yuuka: heheh A&W was such a big part of my childhood. And the eating-in-the-car experience! msB: it is kinda like out there isn’t it? Heheh.